The kit for work, school, picnics, or holiday outings. The LunchKit contains all you need to eat your lunch in style anywhere, anytime. 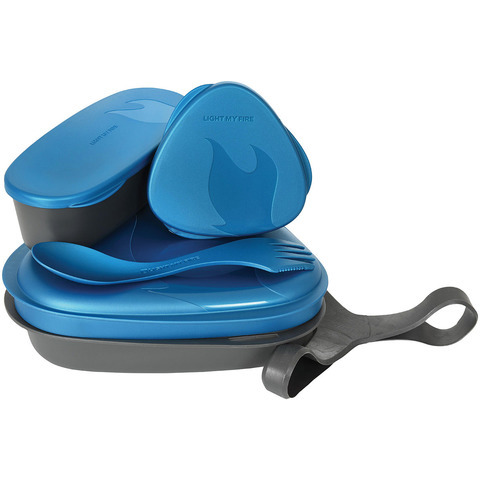 It comes with two high-edged plates, a Spork (spoon-fork-knife combo) and two waterproof SnapBoxes in different shapes and sizes. Now you can easily organize and store your food. Comes with a tight and neat Harness to keep the contents stored safely inside. Constructed from environmentally-friendly, BPA-free polypropylene plastic. Dishwasher and microwave safe. Dimensions (packed): 7.6"" x 7.6"" x 2.4"". Wt: 9.9 oz.